This guide is for the console and Windows game. For the mobile game (iPod/iPhone), see Resident Evil 4 (mobile). Resident Evil 4 (Biohazard 4 (バイオハザード4, Biohazard 4? ); abbreviated to RE4) is an action-adventure, third-person shooter game by Capcom that debuted on the Nintendo GameCube on January 11, 2005. The game was later ported to other platforms such as the PlayStation 2 (with extra content that has been included in all subsequent releases) and Microsoft Windows which was published by Ubisoft. 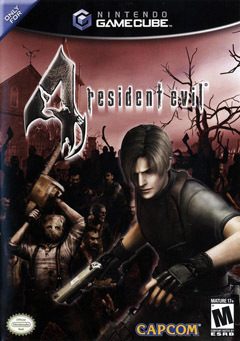 In 2007, the game was released for the Wii titled Resident Evil 4: Wii Edition. This version allowed players to choose from different control schemes such as the Wiimote and Nunchuk, Classic controller, and the GameCube controller. The game was remastered in high definition and released on a single disc alongside Resident Evil Code: Veronica X as part of Biohazard: Revival Selection only in Japan. In all other regions the game was released on both PlayStation Network and Xbox Live Marketplace as Resident Evil 4 HD in September 2011. The game has a few unlockable mini-games, such as Assignment Ada, Mercenaries, and Separate Ways (available in all versions, except GameCube). In the six years since the destruction of Raccoon City, the U.S. government has been able to exterminate the nefarious Umbrella Corporation. Now in 2004, players rejoin Leon S. Kennedy, one of the protagonists of Resident Evil 2, who is now a U.S. agent with a top-secret mission. His investigation into the abduction of the President's daughter has led him to a mysterious location in Spain teeming with unimaginable horrors.